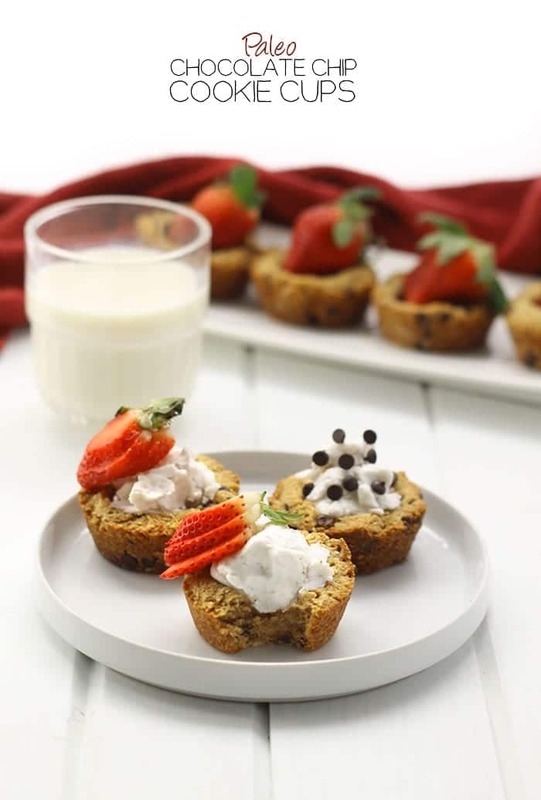 Paleo Chocolate Chip Cookie Cups + Healthy Valentine’s Day Desserts! Who needs a cup when you can eat out of a cookie?! 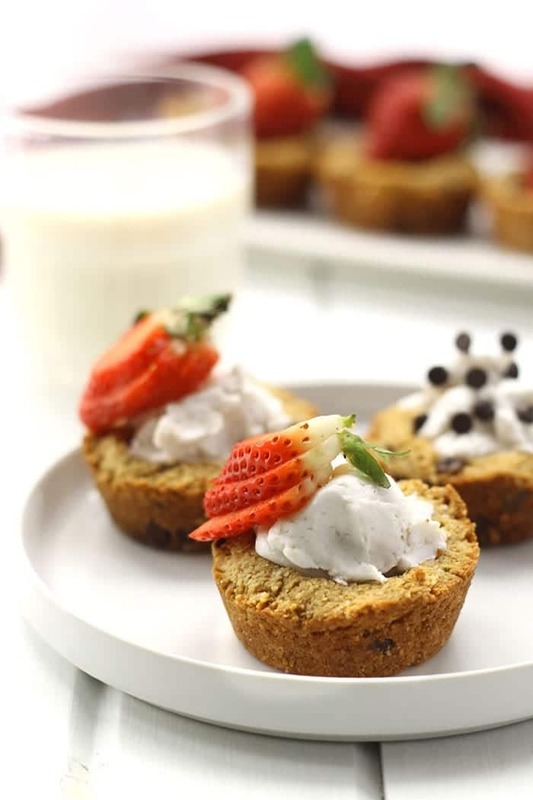 Customize your Paleo Chocolate Chip Cookie Cups by filling them with coconut cream, berries, more chocolate or whatever your heart desires! All you need is a muffin pan and a lot of love. There is only 1 thing that makes me look forward to the month of February: Valentine’s Day. You may remember from last year how much I love Vday. In fact, I dedicated an entire week to Valentine’s Day treats! What can I say? I’m a sucker for love. So when the whole foodie ladies got together to brainstorm ideas for our February round-up, I wasn’t going to back down until we agreed for it to be Vday themed (it didn’t take much convincing btw). Not only am I totally stoked about spreading the Vday love, but I’m quite literally salivating as I write this post. 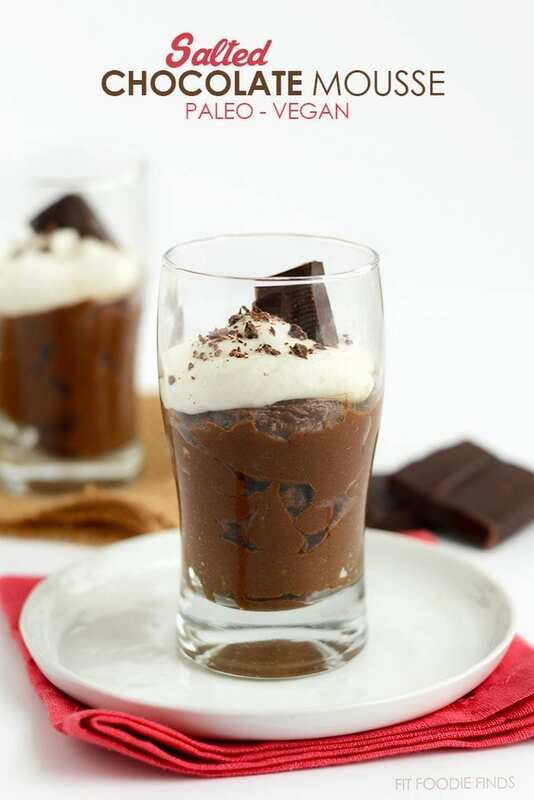 Lee is kicking us off with her Paleo Salted Dark Chocolate Mousse. 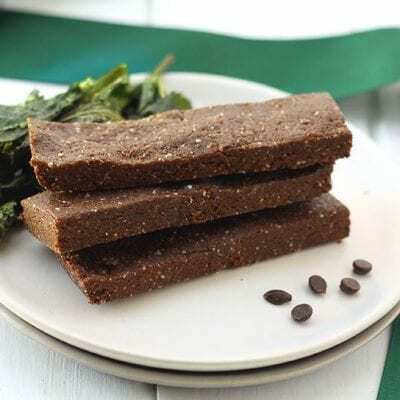 It’s made with an avocado and coconut base, sweetened with maple syrup, and topped off with Himalayan Sea Salt for a decedent, guilt-free dessert! And continuing with the chocolate theme, Brittany brought her A-game with this Chocolate Coconut Tart. It’s rich and creamy and made entirely from whole foods including dates and maple syrup! Just two of you dining for Valentine’s Day? 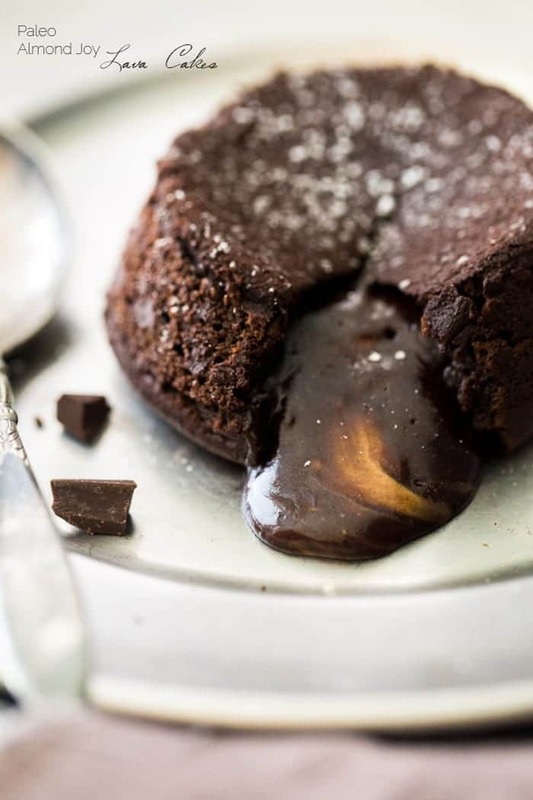 Taylor has you covered with these Paleo Almond Joy Lava Cakes for two! They’re made with coconut oil and the center is made from melted chocolate and almond butter. 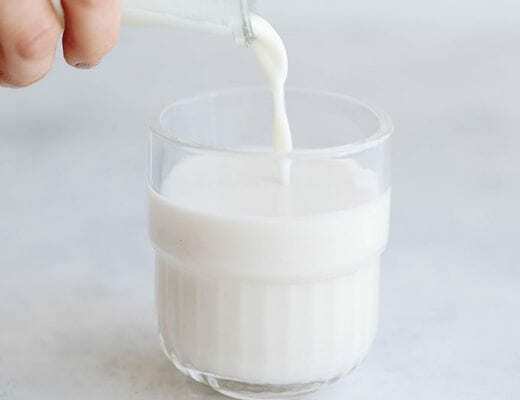 They also use protein powder for a healthier, high protein dessert! It wouldn’t be Vday without some chocolatey, fudgy brownies, would it? 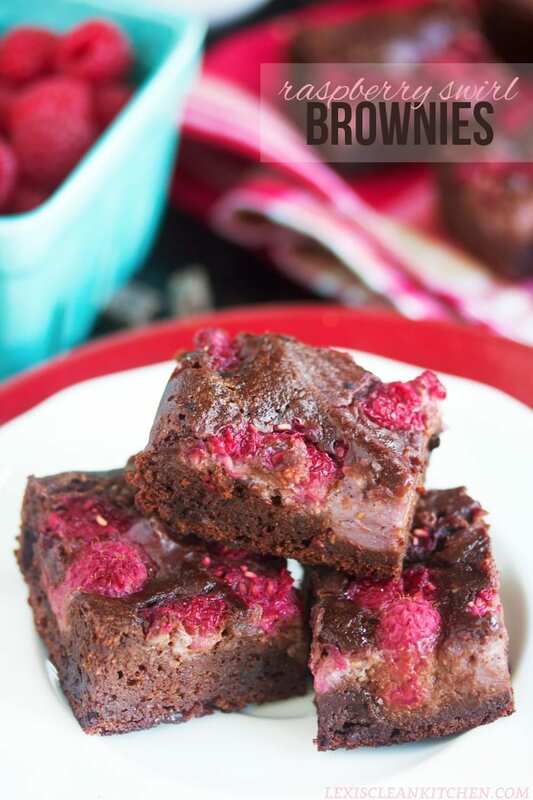 Thankfully Lexi created these amazing Raspberry Swirl Brownies to fill the void. Made with warm chocolate chunks and topped with fresh raspberries and creamy raspberry swirls, these make the perfect festive treat for your Valentine, guilt-free! If you’re not keen on turning your oven on, then Kelly has a serious winner for you! 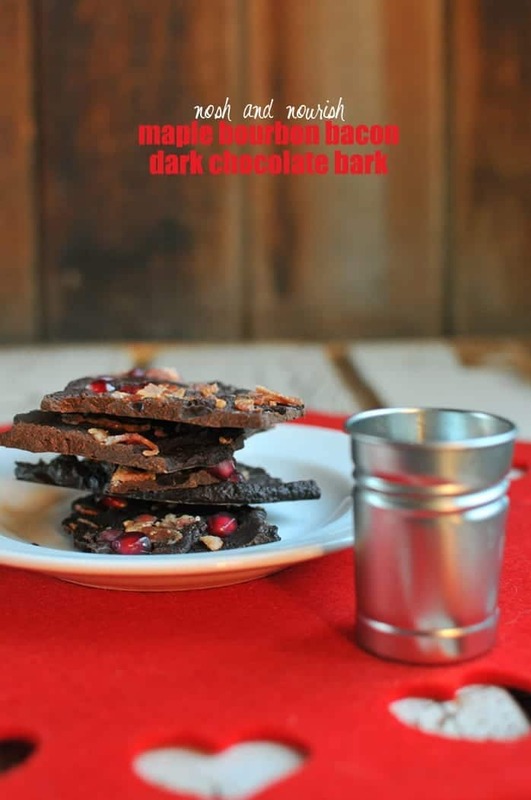 Her Maple Bourbon Bacon Dark Chocolate Bark with Pomegranates is already making my heart flutter! Now onto yours truly’s recipe. While, all of the options above are incredible, there is only one way to my valentine’s heart…chocolate chip cookies. Not oatmeal cookies or shortbread cookies or even gingerbread, JUST chocolate chip cookies. But plain old paleo chocolate chip cookies are boring and certainly not worthy of Valentine’s Day IMO. So I took it up a notch and introduced my fav chocolate chip cookie recipe to it’s new friend…the muffin pan. However, the fun only began here. Once I’d mastered the cookie cups, my life became about finding the perfect filler. 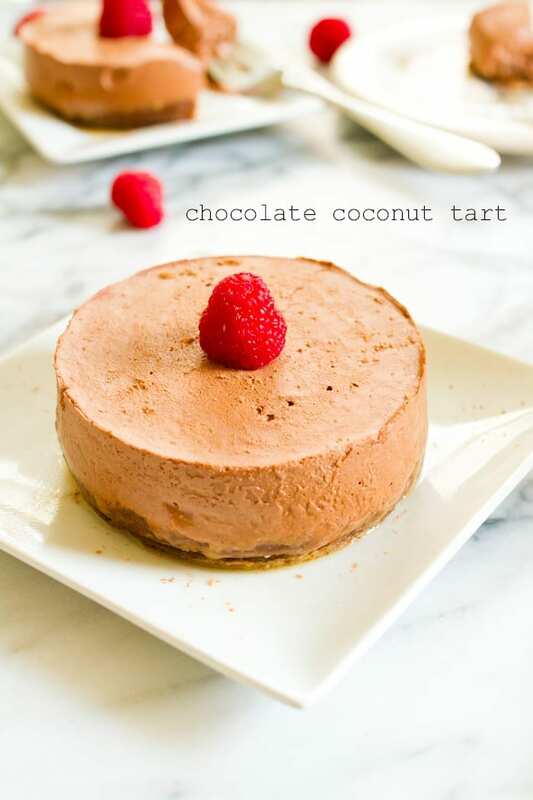 Coconut cream was a total winner in my books, but additional chocolate, berries or even Lee’s salted chocolate mousse from above would be amazing! Or if you’re C then vanilla bean icing. At least the cookie is healthy! Let your creative juices flow and I’d love to see what you fill your cookie cups with! The ultimate Vday gift to me would be if you tagged me in your pictures using the hashtag #TheHealthyMaven on Instagram. Can’t wait to see what you and your valentines come up with. Grease a normal-sized muffin pan very well with coconut oil and set aside. In a large bowl combine almond flour, coconut flour, coconut palm sugar, sea salt and baking soda. In a separate bowl combine egg, egg white, coconut oil, applesauce and vanilla extract. Add wet ingredients to dry and stir until just combined. 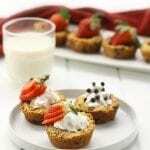 Spoon about 2 tablespoons of dough into each muffin tin and flatten with fingers. Poke a hole in the center (don’t worry, it doesn’t need to be perfect. You will make the hole bigger later. Remove from oven and using the back of a spatula or long round stick (I used the back of an ice cream scooper), create a large hole about 1 inch deep inside each cookie. Place back in the oven and bake for 3 more minutes. 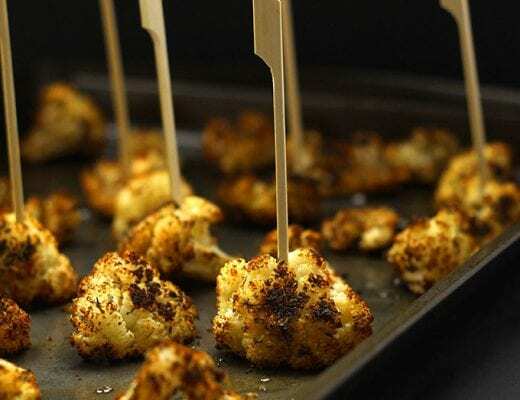 Remove from oven and let cool completely before removing from pan. Use a knife around the edges to loosen cups from pan. Fill with toppings of choice as listed above, or get creative! I keep mine in the refrigerator as I prefer the texture and they last longer…not that they last very long. 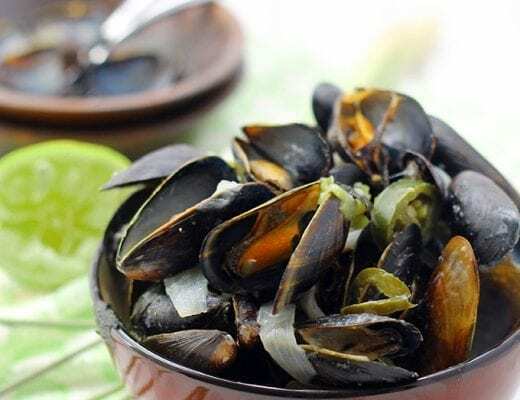 *I’ve only tried these with almond flour, NOT almond meal. Let me know if you have any luck using almond meal. **I use Enjoy Life, dairy-free chocolate chips. What would you fill your cookie cups with? What’s your fave Valentine’s Day dessert? 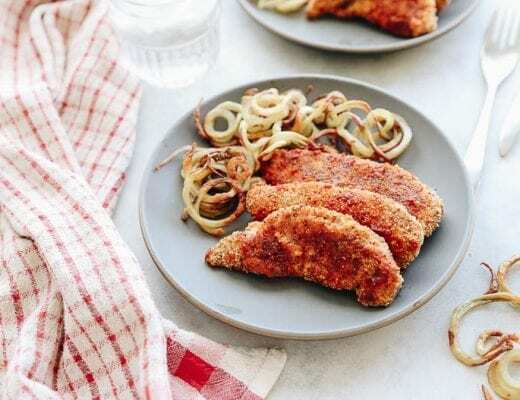 Baked Buffalo Chicken Fingers + I’M GETTING MARRIED! That dark chocolate mousse needs to be in my life asap! So much goodness!!!! Cannot wait to cookie cup it up! I love that these are totally customizable!!!! And paleo?!?!?! YES. These cookie cups are the cutest! I want one right now. All of these look awesome! V-Day is my favorite holiday ever, so I can’t wait to indulge in some tasty desserts. OH YES. 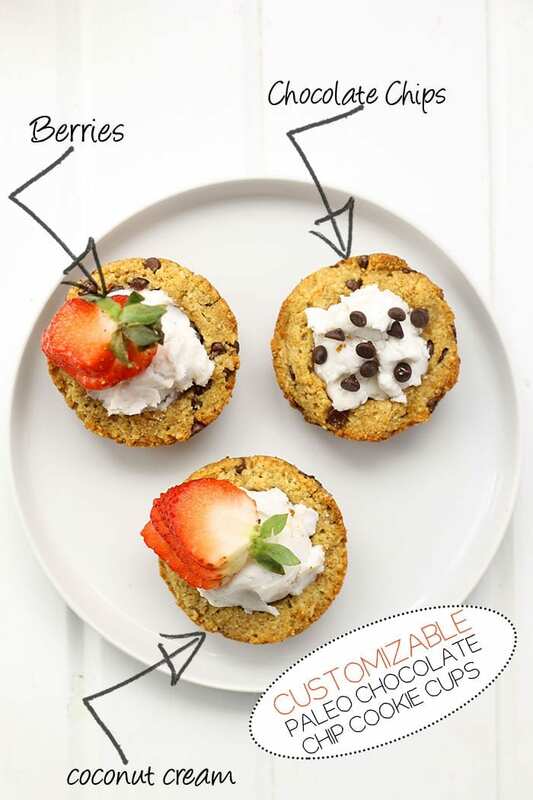 I would fill my cookie cup with Greek yogurt, peanut butter, and sauteed banana slices. I’m dreaming about it already, but I don’t have a kitchen! They’re so cute. I think I would fill mine with coconut cream or some form of chocolaty mouse and top with raspberries and chocolate chips or cocao nibs. Ooooh these are so cute! I would definitely fill mine with dark chocolate chips… because I eat a handful of them pretty much every day and they never get old to me! All of these desserts look seriously to die for! We’re going out for Valentine’s Day dinner, but I think I’m going to have to make one (or more??) of these for pre-dinner dessert haha. Fancy 🙂 I love chocolate in just about all forms but sadly the BF does not. It may not be on the menu for our V-Day plans but I think these cookie cups might just pop up at our next school treat day! You guys are killing it with the paleo desserts today! Between that lava cake and these cookie cups, I’m dying. I haven’t even started thinking bout valentine’s desserts and the blogs are alive with them. Hmmm…now i have to figure out what to make. So many tasty options! Can you send me these please? Even naked without any toppings! Sign me up for a batch of these! And the coconut tart….and the raspberry brownies….I’ll just take one of each how about that? I adore applesauce and coconut oil in baked goods so I know I will love these. These cookie cups are totally cute. Love this idea!! YUM. I’m so imagining these with a hot fudge sauce topped with coconut cream. Oh. Man. My wife just made this last night and it turned out great! She improvised a bit & made a 2nd batch with some peanut butter. Yummy! Tough call.. but I HAVE to try the lava cake! The chocolate cookies were heavenly and I cant believe it is paleo and healthy to eat. Thanks for sharing this because I never thought paleo styled desserts could be so good.